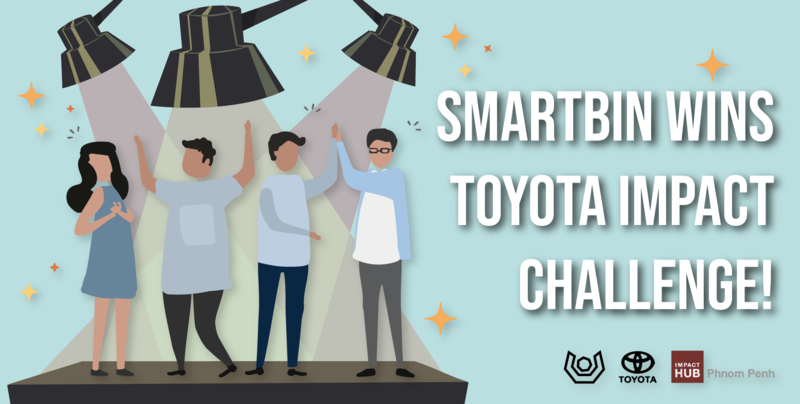 | SmartBin Cambodia Wins Toyota Impact Challenge! SmartBin Cambodia was one of three finalists pitching to a panel of judges at Workspace 1 by Factory Phnom Penh. Along with last mile delivery service Rushero and transport application TosJis, all three teams made fantastic pitches that utilised visual media and it was a tough decision for the judges! For Chanamrithvatey Kim from the SmartBin team, the unexpected result concluded months of efforts and hard work from the team. “I was so excited I was about to cry… it is like a dream come true,” she said. Even with major hurdles in prototyping and fundraising, SmartBin showed off a sleek prototype at their pitch along with concrete plans for future adoption and their business model. Ultimately, team sold the social solutions of their waste management system to the judges, answering their questions well. The improvements in pitches by the three finalists over earlier rounds was impressive, noted judge Cheryl Lee, an Investment Officer at Emerging Market Investment Advisers. The SmartBin team receives the prize of $10,000 from Mr Hiroyuki Itoh. The other judges include Hiroyuki Itoh and Bunhay ly, President and General Manager of Toyota (Cambodia) respectively, and Vichekal Tema, Administration Deputy Director of Phnom Penh City Hall. Organised by Impact Hub Phnom Penh and Toyota Cambodia, the Toyota Impact Challenge 2018 is an entrepreneurship programme focused on improving transport and the environment in Cambodia. Saturday’s pitching event held at concluded the programme 8-month long programme. Olivia Hough, Managing Director of Impact Hub Phnom Penh, was also impressed by the growth the teams have shown, and the promise it holds for future programmes and events by Impact Hub, including the much anticipated launch of the online learning platform at the end of this month.